On this page you will find the research projects under the "Sustainable Ecosystems" course. Scroll below to see the different projects. Under each title heading you will find the abstract to each research project and links to the final presentation as well as links to the researcher's page and/or final report. The purpose of our experiment was to research how sustainability is being applied to the healthcare industry. Our hypothesis stated that if large health organizations such as the Mayo Clinic adopt sustainable practices, then the percentage of money they save would be superior to other hospitals, because the amount of supplies being recycled and/or reprocessed is greater. To test this hypothesis we took three hospitals, two with sustainability programs and one without. The Mayo Clinic and Banner Health were the two with sustainability programs, and St. Joseph’s Hospital lacked any sort of program or organization pertaining to sustainability. Results showed that Banner Health and Mayo Clinic saved greater amounts of supplies and money with their reprocessing programs, compared to St. Joseph’s Hospital. However, our hypothesis was inconclusive because we were not able to design a way to compare the hospitals sizes. In other words, we were not able to find a percentage of the amount of money/supplies saved per capita from each hospital. 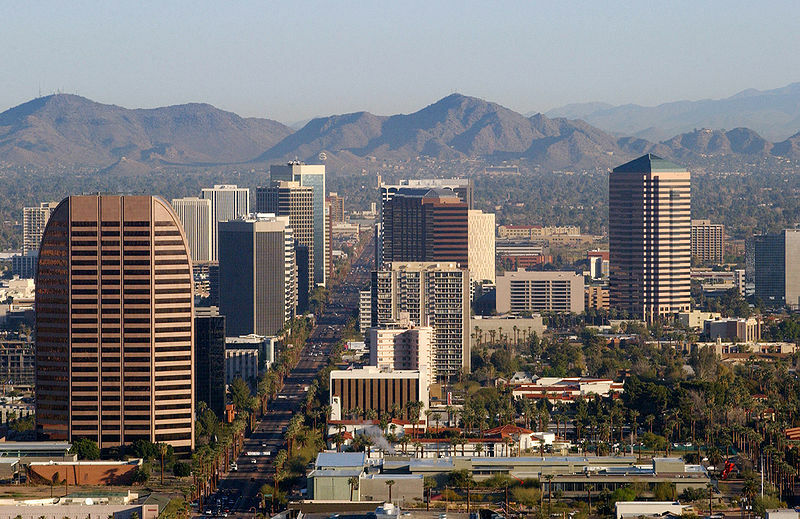 Abstract:The Phoenix Metropolitan Area is one of the largest in the world. The vast expanses of concrete and asphalt that make up the city absorb massive amounts of heat each day and release them at night, surrounding the city in a cloud of warmth. This cloud is called the Urban Heat Island and it is responsible for a dramatic temperature difference between the city and the surrounding countryside. How does this heat affect the organisms within it and nearby? Experiments were conducted comparing the heat of Phoenix, the preserve, and a nearby desert. Abstract: One of the major concerns of urban sprawl and desert development in Phoenix is the effects of our construction on the surrounding environment. In particular, runoff and pollutants from asphalt roads can, when absorbed by the soil, possibly affect its composition and impair its ability to support a desert ecosystem. For this experiment, soil in a desert wash that intersects an asphalt road was chosen for testing. This wash guided water through the desert, over an interrupting road, and continued it into the wash on the other side. This demonstration of nutrient flow interrupted by the road would magnify the affliction on the soil, making whatever effect present obvious in the testing. To test for any effect the road may have, soil samples were taken before and after the road. In the lab, water was run through these samples and tested for pH and conductivity. The readings from the samples before the road would serve as the control, to be compared with the readings from the samples after the road. These results would show any effect the road had on the alkalinity and conductivity of the soil, which are identified as two important properties of adequate soil. Abstract: Sustainable ecosystems provided an opportunity to commence a semester research project relating towards the ecosystem and a relationship with it and sustainability ; which is exactly what this project illustrates. Flora provides nutrients that are essential in maintaining a healthy ecosystem. A healthy ecosystem does not merely affect the flora and fauna but the people around that ecosystem; which is why great interest and attention should be directed towards the relationship between the plant species and its ecosystem.The ecosystem in which the species is found determines the amount of nutrients produced, which surrounding organisms use to flourish in this ecosystem.Illustrated is the following data which reveals how Creosote bush and Palo Verde plant species found in two ecosystems, Sonoran Desert Preserve and CREST garden, obtain varying amounts of nutrients. Abstract: With increasing urbanization, life has had to adapt to changes that humans are creating. This paper examines how urbanization has affected bird species in Phoenix. It takes a look at the diversity of bird populations in three different zones or levels of urbanization: the desert preserves throughout the city, suburbia, and the downtown areas. The results suggest that Phoenix has a more diverse bird population than previously thought, though it is highly recommended that there be more observations preformed under different circumstances with more rigor. Abstract: An increase in pollution can affect the wildlife in many areas, including community parks. This project was aimed to determine what type of human pollution had the greatest affect on parks' native species. Petri dishes were adapted to use as filters to measure air pollution. The ground pollution was counted and recorded into separate categories according to its type. Not much air pollution was found. Although, their was much ground pollution. The data showed that the ground pollution presented the worst impact on the land. Abstract: Community parks are a large part of suburban life and are located in various places within a city. The amount of pollution these parks receives can vary with their locations. The objective of this project was to determine which parks have the most pollution. Ground pollution was measured with the use of transect lines placed randomly in the parks. The collected data showed that more pollution was present in parks surrounded by commercial buildings than by housing. Abstract: The focus of this project was on how polluted are Arizona's lakes. The experiment was conducted at both Cortez and Bartlett lake. Abstract: Hiking is very popular in Arizona and there are many mountains for people to visit. However, this high amount of traffic can have interesting affects on the environment. This project was aimed to determine the affects human traffic had on the biodiversity of mountain ecosystems. Transact lines were used to record the amount of plant and animal life at two mountain locations. Biodiversity was more affected by the type of trail than the amount of traffic.